ANOTHER HOME RUN FROM DESIGN DREAM TEAM. 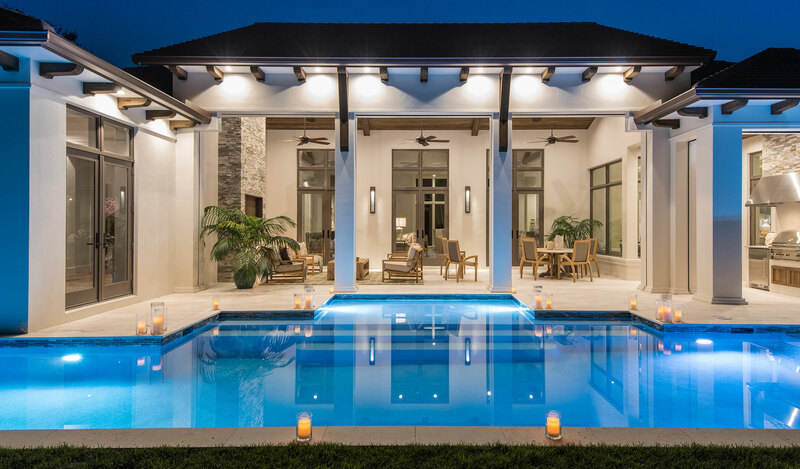 Combining the talented efforts of top luxury home professionals can often create “a perfect storm.” And in Naples, weather aside, this can occur when just the right group joins forces. On this stunning speculative project at 6600 Ridgewood Drive in Pelican Bay, a previously successful trifecta has essentially hit another home run. Calusa Bay Design’s Leslie Sherman, and Realtor/Broker Taber Tagliasacchi of Calusa Bay Properties identified this piece of land for their latest project. “Pelican Bay offers an amazing palette for a prospective buyer, including three miles of white sandy beach, oceanfront dining, 27 holes of golf and a vibrant tennis program, and all within walking distance of Waterside Shops, Artis— Naples and Mercato,” Ms. Sherman says. “It’s the best possible location for a new luxury estate home in all of Naples,” Ms. Tagliasacchi adds. The goal was to design a piece of architecture in the tropical West Indies genre. 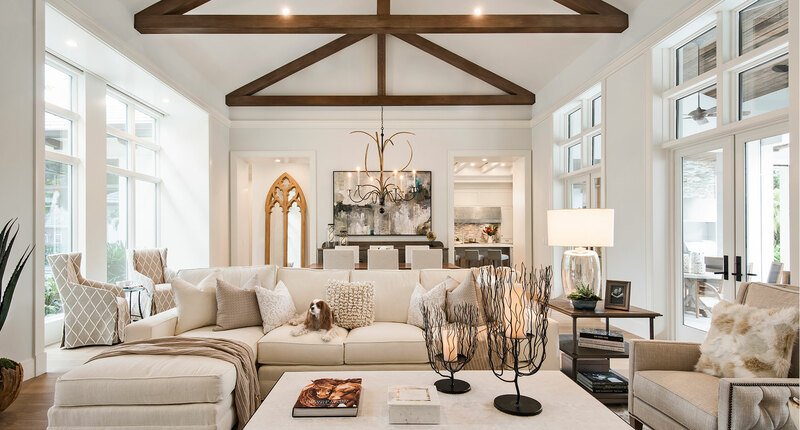 The 20-foot vaulted gable ceiling in the great room created the perfect opportunity for a stunning stained opentruss ceiling detail spanning one end of the great room to the other. The ceiling detail is beautifully accented by the 12-foot double transom windows and French doors that flank both sides of the great room, flooding the room with natural light and creating a dramatic, inviting indoor living space. 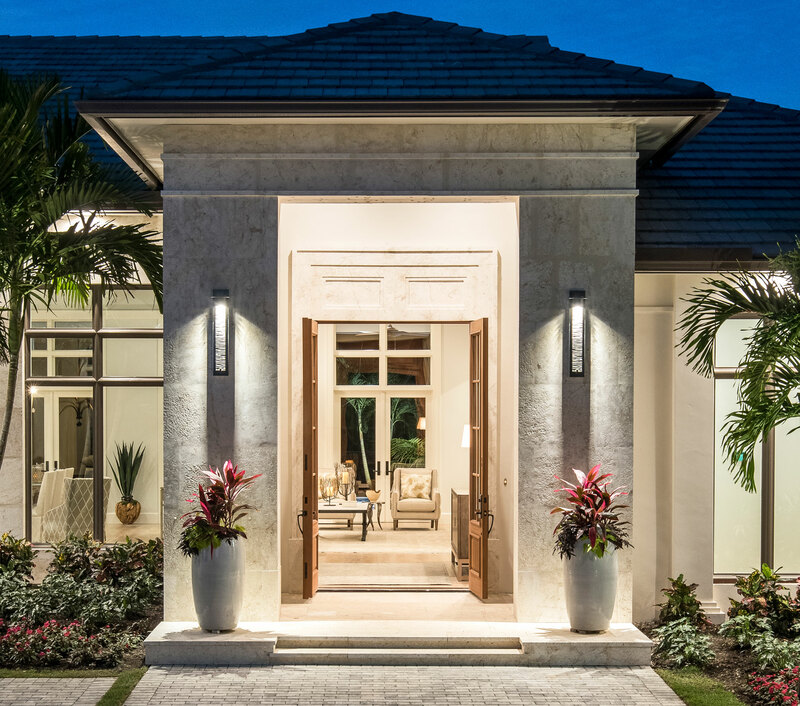 ABOVE: Double mahogany and glass entry doors are flanked by stone columns, tastefully accented with a pair of Hubbardton Forge handmade iron sconce fixtures and matching entry arrangements by Calusa Bay Design. Mr. Cooney says the open, light-filled, spacious design, repeated throughout every room in the house, is one of the hallmarks of his company’s design style. It, like this home, is simply beautiful. As you enter the 25-foot stone entry through mahogany and glass double doors, the spectacular central living area takes your breath away. The single-story, 4,625 square-foot, spa-like retreat features four large en suite bedrooms, a light and bright dedicated home office, 4½ bathrooms and an amazing outdoor living space complete with kitchen, fireplace, TV and remotecontrolled screens and shutters. A product of the combined efforts of Calusa Bay design coordinator Tatum Johansson and the HE Design team of Chad Elkins and Michael Hayes, the spectacular furnishings and décor package incorporates trusted names like Century Furniture, Habersham Home, Baker, Hubbardton Forge, Charleston Forge, Legacy Linens and Loloi Rugs for the ultimate achievement in casual elegance and relaxed sophistication. ABOVE: The outdoor great room has a 20-foot-tall stacked stone fireplace and a full kitchen. The area overlooks a private backyard with 50-foot pool and adjoining infinity spa. Design projects in the bigger metropolitan areas such as Miami or New York City frequently get the bulk of the attention in the media, but seeing a completed project like this reveals the quality, depth of experience and talent right here in Naples. “It is apparent as soon as you arrive at the house that everyone from the landscape designers, to the painters and all of the other trades involved are high-end professionals,” Mr. Hayes says. ABOVE: A glimpse of Stofft Cooney’s open floor plan with views from the kitchen through the great room to the front entry. 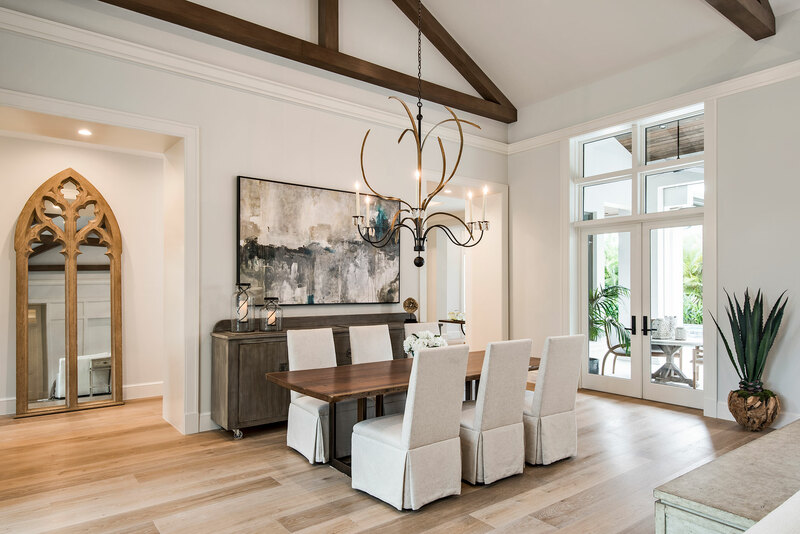 ABOVE: A walnut dining table by Century Furniture is perfectly adorned with a graceful custom chandelier by Low Country Originals. Simple skirted linen side chairs, a soft contemporary painting and a custom-finished Habersham sideboard complete this eclectic, elegant look. 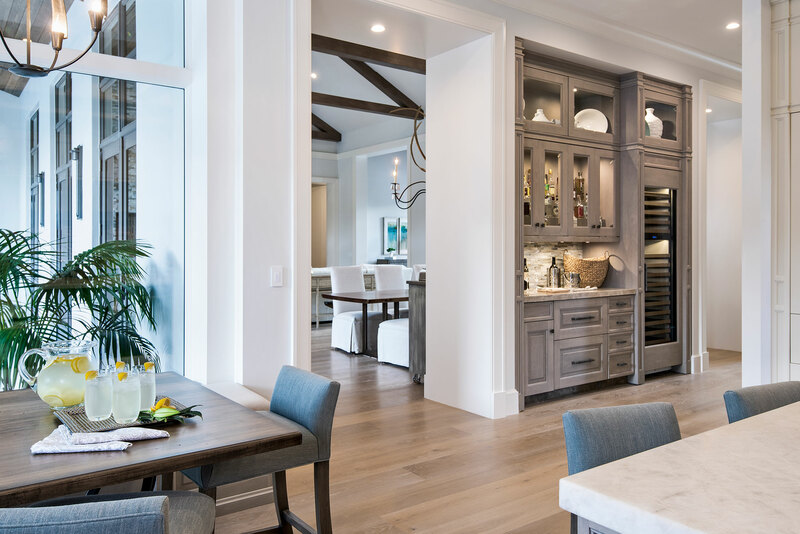 A state-of-the-art chef’s kitchen custom designed by Calusa Bay features a wine and wet bar and built-in butler’s pantry. Both the kitchen and its built-in banquette overlook lush, landscaped grounds, a 50-foot lap pool and an infinity edge spa. 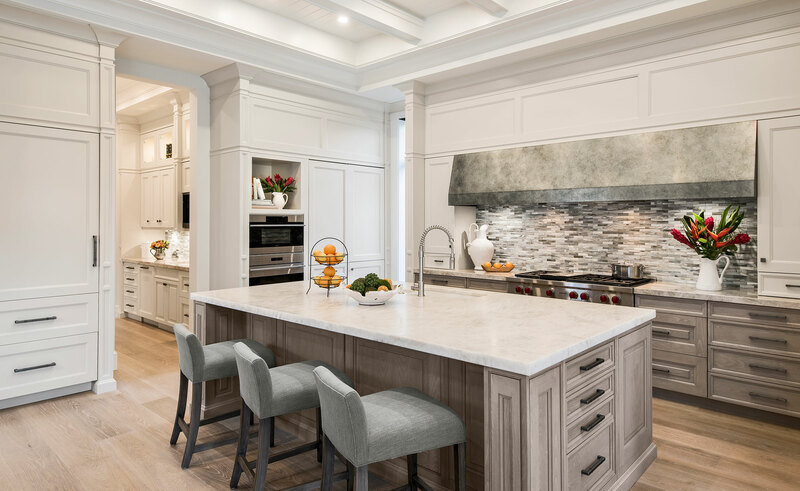 ABOVE: An especially favorite room in this home, the dream kitchen has a large island with 2-inch mitered quartzite counters and a custom 10-foot metal range hood. 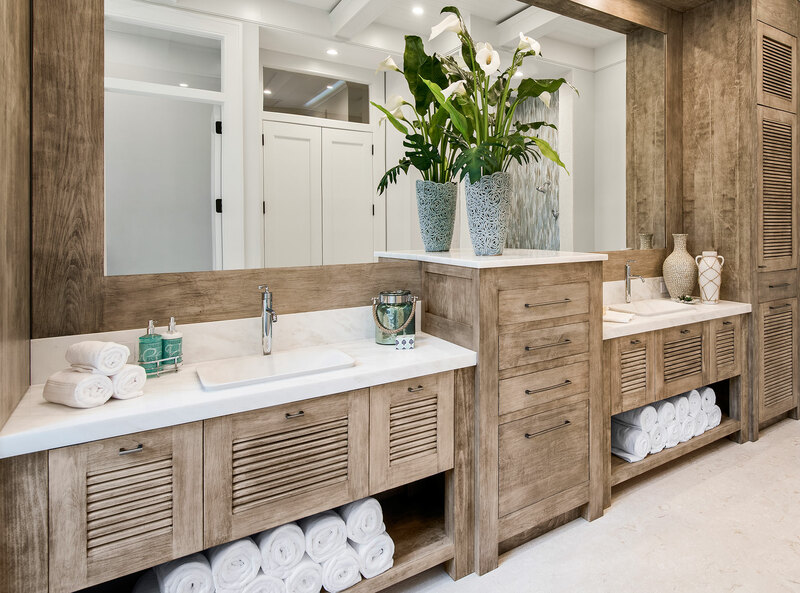 The hood, cabinetry and finishes, all by Calusa Bay Design, introduce a fresh, eclectic, yet elegant style that resonates throughout the home. As Naples real estate continues to grow and flourish, it is homes like these that shift the landscape toward the sophisticated and fresh. Truly custom finishes from Calusa Bay Design, expert architectural design from Stofft Cooney Architects and the highest quality construction detail from Knauf-Koenig Group are what this dream team delivers to the new Naples luxury market.